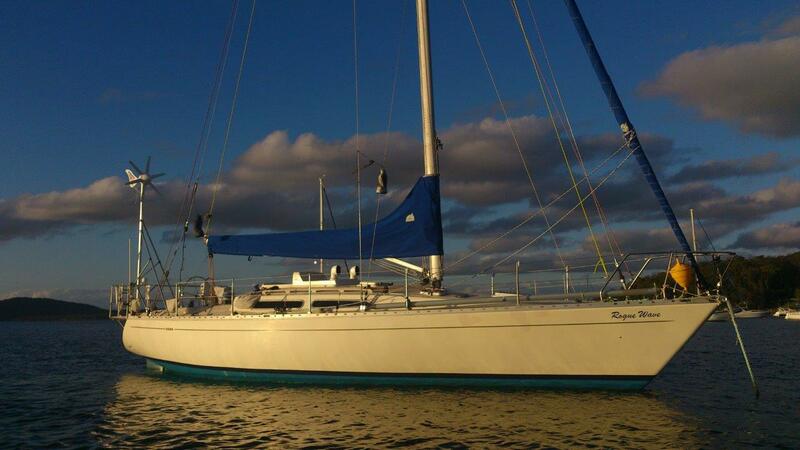 The old 'Rogue' needed to be CAT 1 ready so many hours and dollars were expended to achieve the goal. I started 3 years out to avoid the 'sticker' shock of trying to do all at once. Great idea in theory but you still get some surprises no matter how much you plan....you just need to ensure contingency plans are in order and funded! Backup power generation is also mandatory. 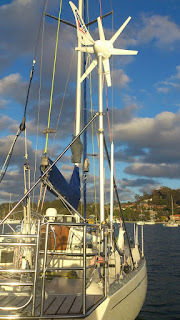 I installed a Rutland 913i Wind Generator system and 40 watt solar panel all running through the Rutland controller. Very quiet system with just a hum that gives you comfort that amps are being generated to cover all my needs without running the engine. 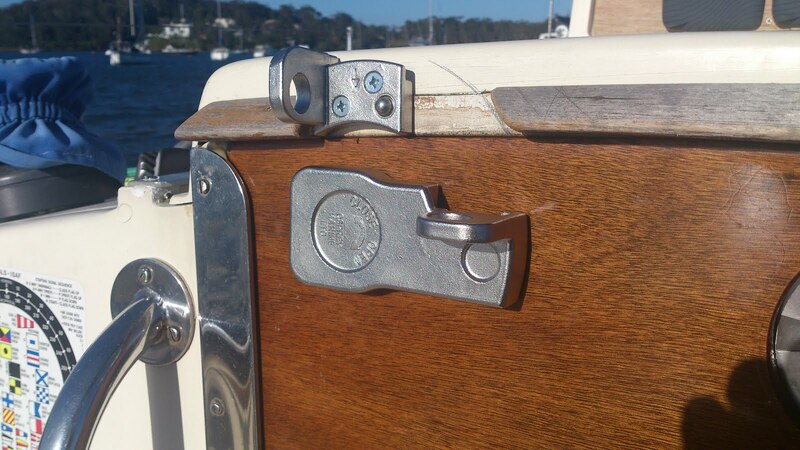 Companionway hatches need to be opened from the interior and exterior and sliding hatches need to be held in either an open or closed position. I installed a beautiful (costly) piece of kit from the UK ensuring the hatch was secure when I left RW locked up in NZ before the race. Electronics required supplementation and upgrading. 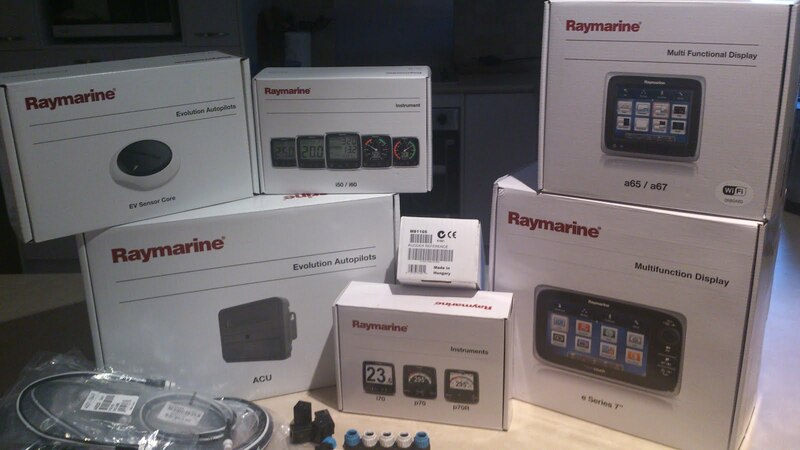 Raymarine came through with a nice sponsorship offer of a new Evolution Autopilot (AP) and discounts on any additional electonics I required. I had most of what I needed already so built in some additional redundancy and added an i50 Close Hauled wind instrument. In return I drafted technical feedback of the AP performance over the outbound cruise and during the race. I married the system to my existing Jefa drive and integrated all with my legacy and Seatalk NG system. 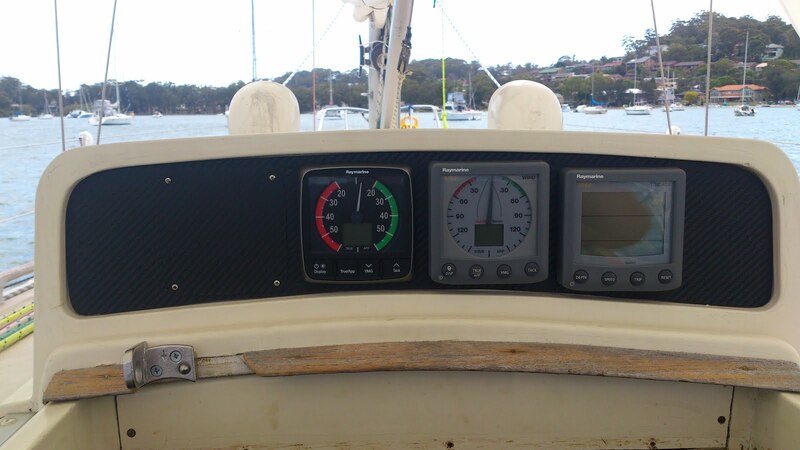 Adjustment o the autopilot could be undertaken from the helm p70 control, helm touchscreen plotter (a65), companionway ST60 control, Nav station e7 plotter or even a tablet giving me total flexibility without the need to use a remote. All was routed through my laptop running Open CPN and SeaPro 3000. I replaced the Ray 101 plotter in the cockpit with a new Raymarine a65 touchscreen installed in a rail pod, starboard of the helm. Not a fan of bright lights in my vision. 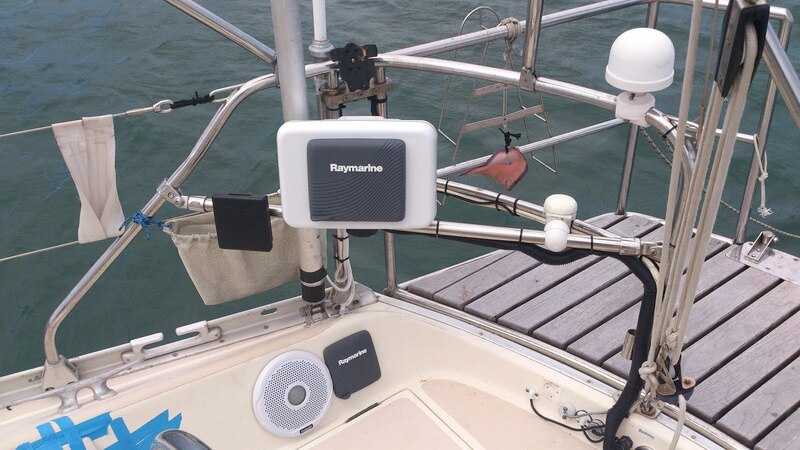 An e7 Raymarine at the chart table serves as the Instrument relay centre repeating an array of data including windspeed, direction, depth, heading, drift, course, heel, boatspeed and speed over ground. An AIS package completes the package. i50 Close Haul, Wind Tridata. An Icom HF radio was installed with Weatherfax on the laptop (plus Android App backup) since I had no Satellite comms for grib files - I was racing blind after three days out when the Grib Files lost there accuracy so did my routing..... this is something I will rectify for the 2018 race. 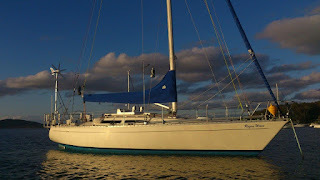 A hired my Liferaft from Great Circle Liferafts in Brisbane and they did me a great deal due to the nature of the event and the need for an extended hire. They even threw in a SPOT tracker so home base could track my movements! 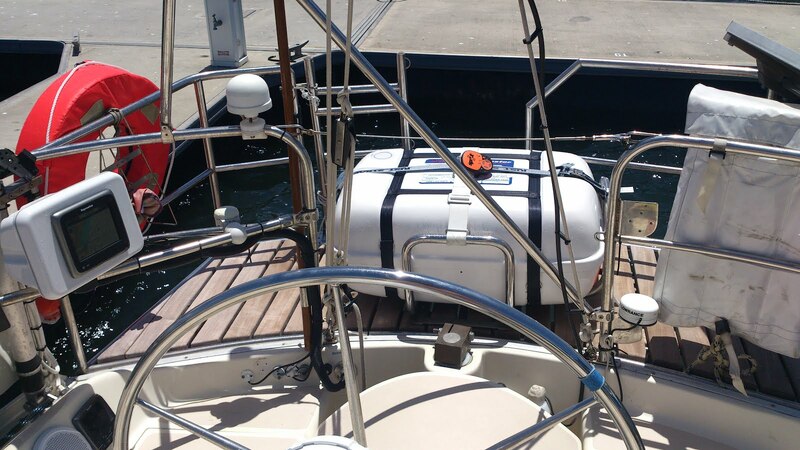 Great Circle Liferaft and Orange Spot Tracker. 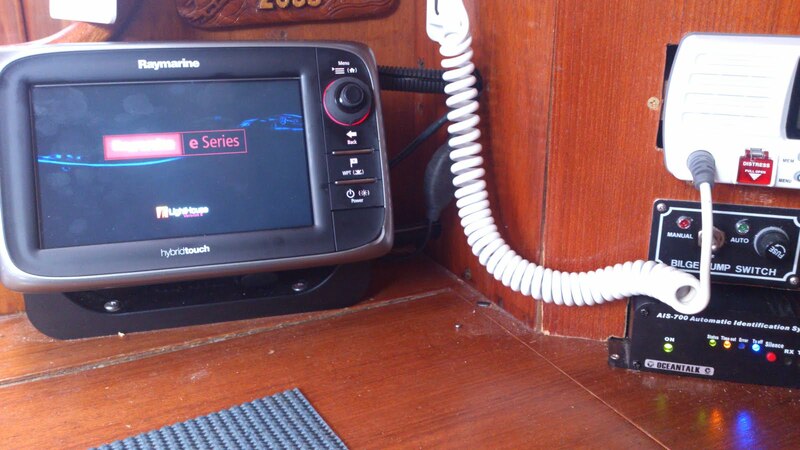 C.A.R.D Radar Detector antenna mounted on starboard rail.